Brrrrrr. It's cold outside. We're talking -10 with the windchill cold. So cold the schools had a 2 hour delay this morning. So cold that walking the puppy has become cruel and unusual punishment. Speaking of the puppy, the poor thing had a rough week last week. He underwent a name change and a neutering in the same day. You may recall we named him after Notre Dame linebacker, Manti Te'o. Well, we didn't want our dog to spend the rest of his life on the receiving end of fake girlfriend jokes. So, now his name is Sully. Although sometimes we refer to him as "The Dog Formerly Known As Manti," and on occasion, "Cujo" or "Conehead." This week I've taken to calling him "Snow Cone," since he's been scooping up snow in his cone and licking it. Anyway, getting back to how cold it's been. At this time of year, I usually embrace the season and decorate with warm, cozy, wintery things. Not this year. I'm over it. I want an escape from dry, cracked skin and numb extremities. I want to be in the tropics. Sadly, a vacation is not in my future. So I did the next best thing. I bought a tropical plant. I can't tell you how much this baby has improved my mood. I know what you're thinking... "you're going to kill it, Carolyn." Well, there is a strong possibility that I will. But I'm going to try really hard not to. It wasn't a big investment. It cost me $10 at Lowe's. And, look... I didn't even spend money on soil. I just plopped the thing right into a pot. Oh yes I did. It's a Yucca Cane. The tag says it is tolerant. We'll see if it tolerates me. 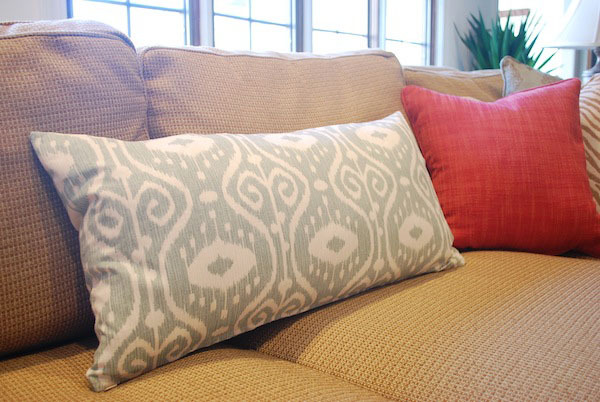 HG pillows are hit or miss, but right now, they're a hit! I saw lots of great ones. So, tell me. Are you embracing the cold winter weather? 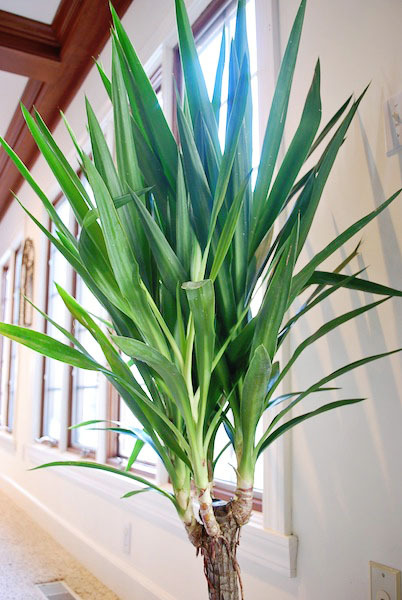 Or is a palm tree on your shopping list? 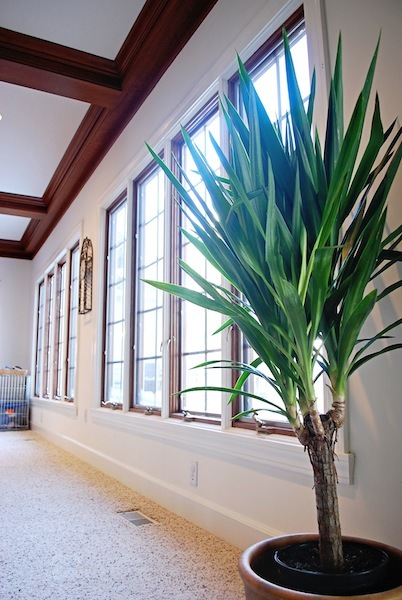 Love your new plant...I can see how it could give you a good tropical feeling. Hope you get a warm up soon! Oh and puppy is adorable...too funny about his name! I would change it too! We move from Charleston South Carolina to Minnesota this summer. It has been -12° here with a windchill of -30. I am 100% over this mess! It should have ended when Christmas ended! A palm tree may be in my future !! i was loving and embracing the cold..... but then the high said 19 and i wasn't very loving or embracing anymore because as you stated- i can't walk my dog. :( and your pup is SOOOOO CUTE. yes, change his name, the poor thing. ;) i have a friend whose son is matteo, and we call him teo for short. maybe you could name him matteo? it's italian for matthew. I'm in deep hyber here in Texas..like a bear..all I want to do is get my ipad, sit by the fire and read my blogs! 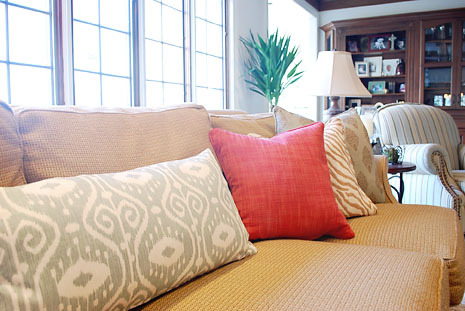 Love the pillows...I have not had much luck lately at HG for pillows but will need to make another trip...We are having temps in the teens tonight...crazy weather! Well, I never embrace the winter. :) I prefer warm sunny days. Your pup is so cute with the cone! Funny story about his name. He sure is a cutie! Your dog is so gorgeous!! And I love that Home Goods pillow. I've got to go see if they have any in my store.